A key concern in the resolution of any claim, whether prior or subsequent to the initiation of actual litigation, is whether the potential resolution proposed will bring final closure to the particular dispute. In a typical case, this may be easily accomplished by requiring a claimant to execute a general release of his or her claims, as consideration for the payment of consideration in the form of monetary remuneration and/or affirmative relief. In conjunction with unambiguous settlement agreements and stipulations of dismissal with prejudice, when applicable, the execution of a properly-worded release – which should include, of course, exculpatory language for the benefit of not only the defendant, but also the defendant’s agents, representatives, principals and insurers – will generally accomplish the critical goal of bringing final resolution and repose to a given dispute. Both the claimant/plaintiff and the respondent/defendant may move forward with their lives and businesses, secure in the knowledge that the dispute, its concurrent disruptions and the fear of possible negative financial consequences, is no more. This ultimate goal is significantly affected, however, by the threat of claims sounding in contribution, indemnity and equitable subrogation. When representing a defendant in any action with multiple potential tortfeasors, or in any action in which there may have been multiple tortfeasors, it is vital to consider the potential for such claims. No counsel wants to see their client released by a plaintiff – who then continues to seek recovery against joint tortfeasors – only to have their client brought back into the case by way of a third-party claim sounding in indemnity or contribution. Such an outcome essentially eliminates the advantages of early settlement or other resolution, insomuch as costs of defense and attorneys’ fees continue to accrue and the danger of a finding of liability remains. There are a number of potential ways to avoid this outcome. For example, a plaintiff may agree, as a condition of any settlement, to include a “hold harmless” provision in the release at issue. Such provisions contractually require a plaintiff to provide a defense to the released party, up to the amount of the settlement monies tendered. It should go without saying that such provisions are not common, and that plaintiffs are far from enthusiastic over the prospect of binding themselves to such terms. Another possibility is to secure releases of potential third-party claims or cross-claims from the joint tortfeasors, as a condition for the payment of settlement monies. It may be emphasized to these parties that, by contributing to settlement of a portion of a larger claim, your client is reducing the potential exposure for all of the joint tortfeasors. Nevertheless, the securing of such releases requires additional negotiation and, to a large extent, depends upon the logic and reasonableness of third parties. It would be vastly preferable if there were a clear legal framework governing how a settlement by a single party affected multi-party litigation and potential apportionment of liability among joint tortfeasors. RELEASE OR COVENANT NOT TO SUE. – When a release or a covenant not to sue or not to enforce judgment is given in good faith to one of two or more persons liable in tort for the same injury or the same wrongful death: (a) it does not discharge any of the other tortfeasors …, but it reduces the claim against the others to the extent of any amount stipulated by the release or the covenant, or in the amount of the consideration paid for it, whichever is greater; and (b) it discharges the tortfeasor to whom it is given from all liability for contribution to any other tortfeasor. 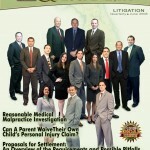 Equitable subrogation presents another situation in which the UACTA protections for parties who make an early exit from a dispute do not apply. Rather than providing a mechanism for bringing a party who settles back into litigation, however, subrogation allows a party who has (1) resolved a matter prior to judgment, (2) has paid 100% of both its and the joint tortfeasor(s)’ obligations and (3) has secured a release or covenant to the benefit of joint tortfeasors, to seek compensation from said joint tortfeasors.7 Accordingly, this concept does not present the danger that §§(5) of UACTA seeks to avoid – i.e. a negotiated resolution that does not bring final closure to litigation for the party who settles. In the final analysis, the UACTA should give considerable peace of mind to any party seeking to resolve its involvement in litigation featuring multiple tortfeasors and identical injuries. While third party actions sounding in indemnification or subrogation may still prevent full and final closure to a proceeding, a defendant who chooses to resolve a claim may avoid the greater danger of a quick third party claim of contribution from a joint tortfeasor, which prevents an effective exit from the dispute. So long as the resolution in question is made in good faith,8 joint tortfeasors will be limited to the comparatively difficult doctrines of indemnity and subrogation – which should be relatively easy to identify at an early stage in any matter – to state their claims. Even if liability is apportioned to the tortfeasor who settled the matter prior to disposition, and even if it be 100% liability in the eyes of the judge or jury, the UCATA provides enviable protection against concurrent or subsequent suit by a joint tortfeasor. In short, by understanding and employing the protections of the UCATA, a defendant may be confident that, once they have gotten out, no one will be pulling them back in. 1 Florida Statute §768.31 (the “UCATA”). 2 See id. at §§(2)(a)-(b)(“…when two or more persons become jointly or severally liable in tort for the same injury to person or property, or for the same wrongful death, there is a right of contribution among them even though judgment has not been recovered against all or any of them … [b] …[n]o tortfeasor is compelled to make contribution beyond her or his own pro rata share of the entire liability.”) This language overruled prior common law rules denying an action in contribution between joint tortfeasors for a single harm. See e.g. St. Paul Fire & Marine Ins. Co. v. Shure, 647 So.2d 877 (Fla. 4th DCA 1994). 3 See id. It should be further noted that actions for intentional torts, breach or trust or breach of fiduciary duty are specifically excluded from the UCATA. See id. at §§(g); see also Bel-Bel Intern. Corp. v. Barnett Bank of South Florida, N.A., 158 B.R. 252 (S.D. Fla. 1993). Accordingly, an intentional tortfeasor, or a tortfeasor who is found to have breached a position of trust or fiduciary relationship cannot seek contribution from a joint tortfeasor. See id. ; see also Robert L. Turchin, Inc. v. Cather Industries, Inc., 487 So.2d 850 (Fla. 4th DCA 1986). 4 See Fla. Stat. §768.31(2)(f). Very generally stated, a claim for indemnity essentially alleges that the party raising the claim should be held entirely harmless for the alleged wrongful act, with 100% of its judgment obligation, if any, paid by a third party/joint tortfeasor. See e.g. Dade County School Bd. v. Radio Station WQBA, 731 So.2d 638 (Fla. 1999). 5 The use of the term “indemnity” in the UCATA has been interpreted to include the closely related concept of subrogation. See McKenzie Tank Lines, Inc. v. Empire Gas Corp., 538 So.2d 482 (Fla. 1st DCA 1989). As with indemnification, subrogation may be either contractual or equitable. See id. 6 See generally Radio Station WQBA, 731 So.2d 638. 8 See Boca Raton Transp., Inc. v. Zaldivar, 648 So.2d 812 (Fla. 4th DCA 1995); see also International Action Sports, Inc. v. Sabellico, 573 So.2d 928 (Fla. 3d DCA 1991). In Florida, there were 37,364 properties subject to foreclosure actions in May of 2008.3 This equates to roughly one out of every 228 Florida households being subject to a foreclosure action, making Florida the state with the fourth highest foreclosure rate in the United States during this period.4 Predictably, the substantial number of foreclosure actions has led to an increase in litigation in which various professionals, including closing agents, have been sued for malpractice relative to their roles in these real estate transactions. Relative to claims for malpractice, closing agents may face liability in the event that they fail to discover a lis pendens on a property, and allow a real estate transaction to close without notifying the subject parties of the existing lis pendens. In an effort to avoid potential liability resulting from failing to discover the existence of a lis pendens, closing agents may be well advised to perform due diligence, such as obtaining a title search, a tax search, and checking the payoff balances of any existing mortgages on a property, before permitting a transaction to close. Today, with many property records available online, and the potential liability from failing to discover an existing lis pendens, it may make sense for closing agents to determine if a property is in foreclosure, and to find out if a lis pendens has been filed on the property, prior to closing. In taking such preventative measures early on, closing agents may be able to avoid liability from claims of malpractice developing from separate foreclosure lawsuits, which are being filed at increasing rates in the State of Florida. 1 RealthyTrac Staff, “Foreclosure Activity Increases 7 Percent in May” (May 2008), http://www.realtytrac.com/ContentManagement/pressrelease.aspx?ChannelID=9&ItemID=4728&accnt=64847. 5 See Von Mitschke-Collande v. Kramer, 869 So.2d 1246, 1249 (Fla. 3d DCA 2004). 6 See Von Mitschke-Collande, 869 So.2d at 1249. 7 See RealthyTrac Staff, “Foreclosure Activity Increases 7 Percent in May” (May 2008). 8 Fla. Stat. §48.23 (1)(a). 11 See Alamagan Corp. v. Daniels Group, Inc., 809 So.2d 22, 28 (Fla. 3d DCA 2002). In Alamagan, a real estate broker was awarded a final judgment for her commission against the purchaser of the subject property; however, the purchaser refused to pay the broker’s commission. The court determined that the broker’s filing of a lis pendens was the only step that the broker could take to preserve her rights. 12 Fla. Stat. §48.23 (1)(b). 13 Id. Except for the interest of persons in possession or easements of use, the filing for record of such notice of lis pendens shall constitute a bar to the enforcement against the property of unrecorded mortgages and other liens, unless the holder of any such unrecorded interest or liens shall intervene in such proceedings within 20 days after the filing and recording of said notice of lis pendens. 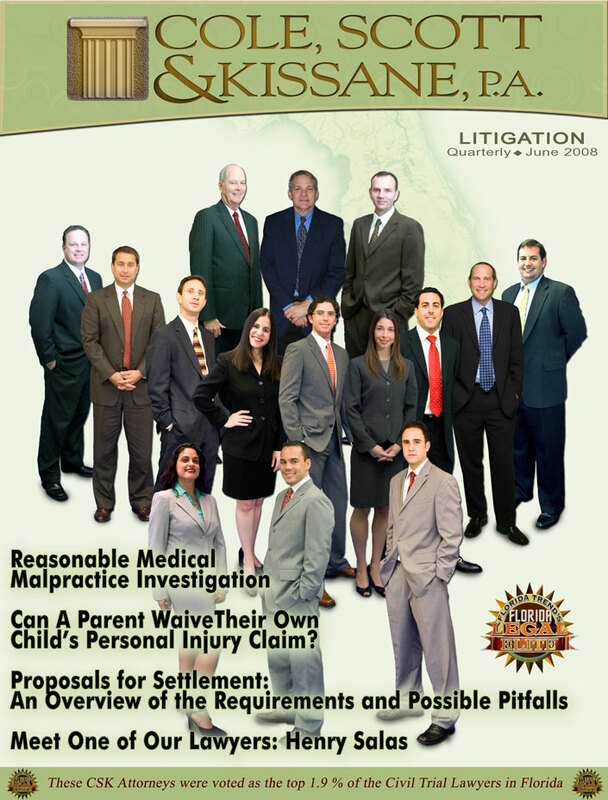 A parent does not generally have the authority to enter into an exculpatory agreement on behalf of their child under Florida law, with some exceptions.4 However, recent decisions allowing the enforcement of arbitration clauses signed by parents on behalf of their children have caused a recent string of decisions allowing a parent to sign away a minor child’s right to sue with a pre-injury release under all circumstances.5 The issue is currently before the Florida Supreme Court. The Court recently heard oral arguments on June 11, 2008. The cases currently pending before the Florida Supreme Court, and the reasoning behind the various arguments, are addressed in this article. Nevertheless, the cases holding that a parent does not have a right to decide what is best for their own child are not grounded on sound public policy arguments. The most often used analogy of the plaintiff’s bar in backing this argument revolves around a parent’s inability to resolve a minor child’s claim without court approval. However, this argument does not take into account the everyday decisions that a parent makes for their child on a day-in and day-out basis. In fact, the state should have absolutely no place in telling a parent what is best for the child, unless a court of law has determined that the parent is unfit. An analysis of this issue begins with the Fourteenth Amendment which gives parent’s a fundamental right to make decisions relating to their minor children. Additionally, under Article I, Section 23 of the Florida Constitution, parents have a right to make decisions about their child’s welfare without interference from third parties. However, this right has been limited by the Florida legislature to require the court’s approval prior to a parent settling claims on behalf of a minor child.8 In Von Eiff v. Azicri,9 the court found that “neither the legislature nor the courts may properly intervene in parental decision-making.” However, those against pre-injury releases have argued that a parent should not be permitted to “sign away” a child’s personal injury claim. The public policy arguments in favor of this general exception revolve around the need to allow these releases to make it easier for community-based entities to recruit employees and volunteers and limit the financial burden of expensive lawsuits and overbearing insurance premiums. If the courts did not uphold these exculpatory clauses, then the community would lose very important programs for the enrichment of the community as a whole. The Supreme Court of Florida recently reversed the Fourth District Court of Appeal and upheld an arbitration provision in a pre-injury release finding it enforceable.18 In the Shea case, the mother of the minor child executed a pre-injury release which contained a provision for arbitration. While on the safari, the minor child was tragically killed. His father brought suit on behalf of the minor child’s estate and under the Wrongful Death Act. However, defendant, Global Travel moved to compel arbitration citing the arbitration provision in the pre-injury release. The trial court upheld the arbitration provision. However, on appeal, the Fourth District Court of Appeal reversed the trial court’s ruling. The Shea court reasoned that parental authority over decisions involving their minor children derives from the liberty interest contained in the United States and Florida Constitutions.19 Furthermore, the legislature or the courts may properly intervene in parental decision making absent significant harm to the child threatened by or resulting from those decisions. The Court refused to make value judgments regarding the parents’ decision to take a minor child on a safari, as the decision may have been made to expand the horizons of the child in a manner that only a parent should be able to make. The Fifth District Court of Appeal in Lantz v. Iron Horse Saloon, Inc, also upheld a pre-injury release finding it valid and enforceable even though the release was in favor of a commercial enterprise. The court addressed a pre-injury release which released the premises owner “from all… causes of action, suits… damages… claims and demands whatsoever, in law or in equity, which [parent] ever had… or may have, against [owner]” which was executed by the parent allowing her son to ride a “pocket bike.” The court found the release to be clear and unequivocal. However, the court never addressed the public policy concerns associated with a parent’s right to sign the contract. In the Applegate case, the parents of a minor child signed an exculpatory clause releasing the Defendant, Cable Water Ski, L.C. from liability. The Plaintiffs later brought suit against the Defendant, Cable Water Ski, L.C., for injuries which the child suffered while attending the Defendant’s camp. On appeal, the Fifth District Court of Appeal addressed whether a contract containing an exculpatory clause was enforceable, signed by a parent on behalf of their minor child, in favor of a commercial enterprise. Accordingly, the court acknowledged a distinction between public policy relative to commercial enterprises, who, according to the court are able to insure against the risk of loss and activities for children sponsored by not-for-profit, community-based organizations and entities. The court then ruled that the exculpatory contract was not enforceable as it was signed in favor of a commercial entity. However, the court then certified the question as one of great public importance for the Supreme Court to decide. We believe in keeping with the precedent found in the Shea case, the Supreme Court will uphold a parent’s ability to sign a pre-injury release on behalf of a minor child, thereby waiving their right to pursue a claim as a parent should have the right to determine what is best for their own child without any interference from the state. Determine the type of entity which the pre-injury release seeks to release from liability. Specifically, whether the entity is a commercial enterprise or a not-for-profit, community-based organization. 1 Theis v. J & J Racing Promotions, 571 So.2d 92 (Fla. 2nd DCA 2005). 2 Goyings v. Jack and Ruth Eckerds Foundation, 403 So.2d 1144 (Fla. 2nd DCA 1981). 3 Lantz v. Iron Horse Saloon, Inc., 717 So.2d 590 (Fla. 5th DCA 1998). 4 In re Complaint of Royal Caribbean Cruises, 403 F.Supp.2d 1168, 1173 (S.D.Fla.2005). 5 Applegate v. Cable Water Ski, L.C. 974 So.2d 1112, 1115 (Fla. 5th DCA 2008); Lantz v. Iron Horse Saloon, Inc., 717 So.2d 590 (Fla. 5th DCA 1998). 6 961 So.2d 1127 (Fla. 4th DCA 2007). 8 Fla. Stat. § 744.387. 9 720 So.2d 510, 516 (Fla. 1998). 10 In re Complaint of Royal Caribbean Cruises, 403 F.Supp.2d 1168, 1173 (S.D.Fla.2005). 15 Global Travel Marketing, Inc. v. Shea, 908 So.2d 392 404 (Fla. 2005). 18 Global Travel Marketing, Inc. v. Shea, 908 So.2d 392, (Fla. 2005). 20 Lantz v. Iron Horse Saloon, Inc., 717 So.2d 590 (Fla. 5th DCA 1998); Applegate v. Cable Water Ski, L.C. 974 So.2d 1112, 1115 (Fla. 5th DCA 2008). Trial courts have inherent authority to dismiss lawsuits when one of the parties perpetrates fraud on the court or refuses to comply with court orders.1 However, in application, this is a remedy that is rarely used, “only upon the most blatant showing of fraud, pretense, collusion, or other similar wrong doing.”2 While there is no simple test to establish when courts will dismiss a case for fraud, relevant case law helps provide a guide as to the factors that are influential in that decision. Material misrepresentations made in a sworn capacity regarding issues such as the Plaintiff’s identity or medical background have been held to be enough to warrant dismissal based on fraud. In Cox v. Burke,3 one of the leading fraud cases in the Fifth District, the Plaintiff sued two attorneys who had allegedly failed to properly litigate a medical malpractice suit which they had been retained to bring on her behalf. In their defense, the defendants asserted that the Plaintiff had committed fraud on the court by making material misrepresentations about her identity, damage, and prior injuries. The trial court agreed that the Plaintiff had committed fraud on the court, and thus dismissed the Plaintiff’s Complaint based on these material misrepresentations. On remand, the Fifth District Court of Appeals echoed the Federal Court’s ruling in Aoude v. Mobil Oil Corp.,4 that in order to dismiss a case, the requisite level of fraud must be such that “it can be demonstrated, clearly and convincingly, that a party has sentiently set in motion some unconscionable scheme calculated to interfere with the judicial system’s ability to impartially adjudicate a matter by improperly influencing the trier of fact or unfairly hampering the presentation of the opposing party’s claim or defense.”5 Further, the Appellate Court stated that when considering whether a case should be dismissed for fraud, the Court should carefully consider both the public policy of maintaining the integrity of the judicial system as well as the competing policy of maintaining a judicial system which adjudicates cases based on their merits, and use dismissal as a remedy only in the most extreme situations since it is the most severe of all possible sanctions.6 Ultimately, the court held that when considering all of these factors, the fact that the Plaintiff provided several false and misleading answers in sworn discovery regarding material issues such as prior medical history and identity was enough to constitute fraud such that the trial court did not abuse its discretion in dismissing the claim. Furthermore, in Distefano v. State Farm Mut. Auto. Ins. Co.,7 the Plaintiff in a personal injury suit repeatedly failed to disclose injuries she had sustained both prior and subsequent to the accident in question, as well as the related accidents. As such, the trial court found that the Plaintiff “knowingly concealed the existence of these prior knee injuries with the intent to perpetuate a fraud upon the Court,” and held that based on the number of times the Plaintiff had attempted to conceal the information, the case should properly be dismissed for fraud.8 On remand, the First District Court of Appeals affirmed the trial court’s decisions, and held that the Ms. Distefano’s actions were so egregious and willful as to constitute fraud on the Court. In conclusion, the various appellate courts’ willingness to dismiss cases based on fraud on the court is very fact-intensive; however, some general rules can be extrapolated from the case law. When a party makes false statements under oath regarding material issues, such as his or her identity, medical history, or other relevant issues that deal with the heart of the litigation, such as in sworn discovery responses or during deposition, the court will generally hold that such statements constitute fraud such that dismissal is warranted. However, mere false statements are generally not enough; there must additionally be some indicia of willfulness or collusion – such as repeated misstatements about facts that are material and highly detrimental to the Plaintiff, or misrepresentations or omissions that are highly unlikely to be caused by poor memory or mistake. Since dismissal is the “death knell of the lawsuit,”20 it is not favored, and if the Court believes that the false statements could be attributed to poor memory or mistake, it will most likely hold that the statements do not rise to the level of egregiousness needed to dismiss the case. 1 Kornblum v. Schneider, 609 So.2d 138 (Fla. 4th DCA 1992). 2 Granados v. Zehr, 979 So.2d 1155 (Fla. 5th DCA 2008). 3 706 So.2d 43 (Fla. 5th DCA 1998). 4 892 F.2d 1115 (1st Cir. 1989). 5 Cox at 46 (quoting Aoude at 1118). 6 Cox at 46 (citing Bird v. Hardrives of Delray, Inc., 644 So.2d 89 (Fla. 4th DCA 1994)). 7 846 So.2d 572 (Fla. 1st DCA 2003). 9 697 So.2d 1011 (Fla. 4th DCA 1997). 11 358 So.2d 58 (Fla. 3d DCA 1978). 13 962 So.2d 1059 (Fla. 5th DCA 2007). 16 859 So.2d 574 (Fla. 5th DCA 2003). 18 854 So.2d 812 (Fla. 4th DCA 2003). 20 Cox at 46 (quoting Aoude at 1118).